In 2010, the state of North Carolina identified 13 major health focus areas and established 41 health objectives and targets to meet by the year 2020. As part of the state’s ‘Healthy NC 2020’ improvement plan, the state identified a ‘Physical Activity and Nutrition’ focus area and developed four measurable objectives for it, recognizing that this area is an essential part of individual health throughout one’s lifespan. Unfortunately, analysis of new data shows that North Carolina has not made any progress on two of its physical and nutrition health objectives since 2008. Today, more high school students are overweight or obese, and fewer adults are now eating at least one fruit a day. 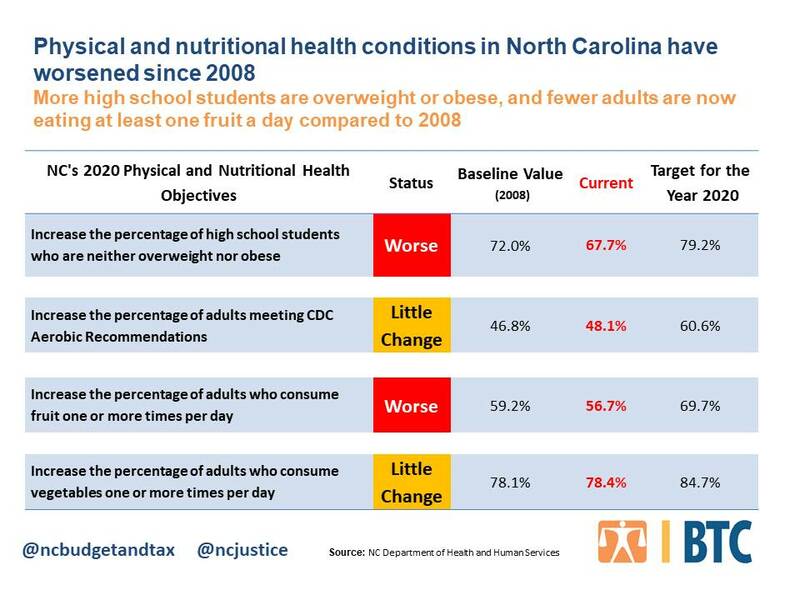 In other words, North Carolina’s physical and nutritional health in these areas has only gotten worse since 2008. Meanwhile, there has been very little change when it comes to adults consuming vegetables and meeting national aerobic recommendations. Moreover, along with our state’s worsening of physical and nutritional health conditions, analysis also shows that, since 2008, funding for the state’s Division of Public Health has been cut by 27.7 percent, or $59.9 million. This is concerning considering that this division is responsible for promoting and contributing to the highest possible level of health for the people of North Carolina. Achieving our state’s physical activity and nutritional health goals should be a top priority if we are serious about making North Carolina “one of the healthiest states in the nation.” If North Carolina does not make progress in this area, it will pose significant health concerns for not only children and adults, but also for future generations. “Excess weight increases an individual’s risk of developing type 2 diabetes, high blood pressure, heart disease, certain cancers, and stroke,” according to the state. Increased physical activity and improved nutrition are among the many factors that can help individuals reach and maintain a healthy weight and improve mental health.